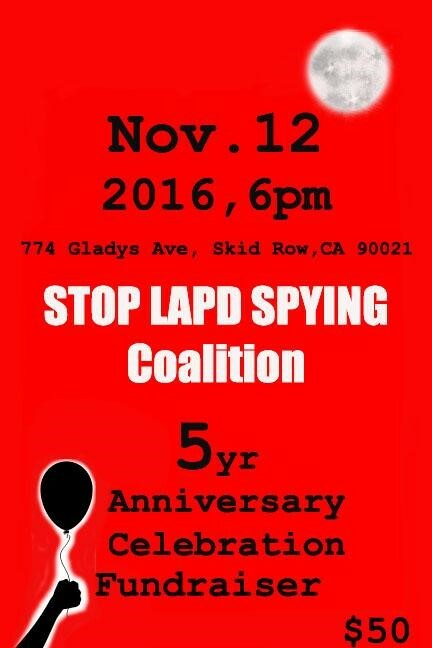 The Stop LAPD Spying Coalition seeks your support by attending, sponsoring, and/or donating to our 5 year Anniversary and Celebration on November 12, 2016 at 6 PM at Bodega Califas in Skid Row at 774 Gladys Ave., Los Angeles, CA 90021. The Stop LAPD Spying Coalition is working tirelessly to expose and dismantle the architecture of state and domestic surveillance, spying and infiltration that impacts our daily lives. We work towards building strong self sustaining communities of health and wellness. We will be showcasing our work and honoring some of our community partners who have been committed supporters of the coalition’s work. To purchase advance tickets online as a secure transaction, use your debit or credit card, or PayPal account. Note: there will be an additional charge of 3% added to the total of your purchase to cover the transaction fee. Each ticket will therefore cost $51.50 if purchased online in order to cover this fee. On the DONATE page, enter the amount that reflects the number of $50 tickets you want to purchase (1 ticket = $51.50, 2 tickets = $103, and so on), and select one-time donation. Enter payment information from your debit or credit card, or from your PayPal account. 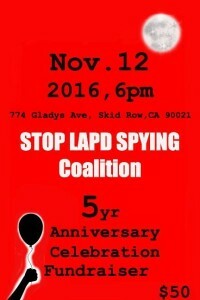 Then, where the form asks if you have a special designation for your contribution, please select “Stop LAPD Spying Coalition 5yr Anniversary Celebration” from the dropdown menu. In the “Giving Option” section at the bottom of the page, be sure to select the “100% donation” option. Following these steps will ensure that we will have your name at the front door at our celebration! Tickets will also be available at the door on the day of the event for a cost of $75 a piece. Get your tickets early for the best deal! Thank you for your support. We look forward to seeing you on November 12th. For further questions, please email us at stoplapdspying@gmail.com or call 424-209-7450.